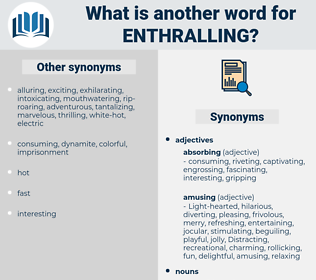 What is another word for enthralling? Operose, pedantic, sterile, unexciting, discouraging, demoralizing, dispiriting, unattractive, monotonous, disheartening. The poem may be and will be read by them as " Gulliver's Travels" is read to - day by young and old, by poet and politician alike, not for its original satire, but for its picturesque, dramatic, and enthralling tale. Here, for a short space of time, the Pagan rested his weary frame, and aroused himself insensibly from the enthralling meditations which had hitherto blinded him to the troubled aspect of the world around him.